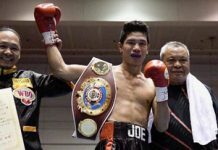 MANILA – Negrense boxer Ricardo Sueno captured the WBC Asian Boxing Council Continental flyweight title after a unanimous decision win over Diomel Dioces at The Flash Grand Ballroom of the Elorde Sports Complex in Paranaque City. This was the first professional boxing title of the Sagay City, Negros Occidental native Sueno and was also his sixth consecutive victory since his back-to-back losses to Kenneth Gentalan in 2016. Sueno was the aggressor early in his first-ever championship bout when he pummeled Dioces with multiple punches, including a huge left straight that rocked the defense of the latter. Dioces attempted to turn things around in the second half of the bout but Sueno regained his dominance with his counter punches enough to secure a favorable score from the judges. With the victory, the 24-year-old Sueno improved his record to 9-2-4 win-loss-draw slate, with three stoppage wins, while the 25-year-old Dioces dropped to 13-3-3 card, including four knockout wins. In the undercard bout of fight card organized by Elorde International Productions of Gabriel S. Elorde Jr., Aklanon Delmar Pellio extended his unbeaten run following a unanimous decision victory over Jasper Cayno.